Having an issue with lightdm. Opened the PC this morning, and it was stuck in booting. Sshed into it, and I can see lightdm is crashing. I didn’t change any hardware and I didn’t install anything new since yesterday ( when it was working ). system up to date? “Opened the PC” means resume from suspend? or power on from powered of? @joekamprad Means booting normally. PC always gets powered down. O.K. 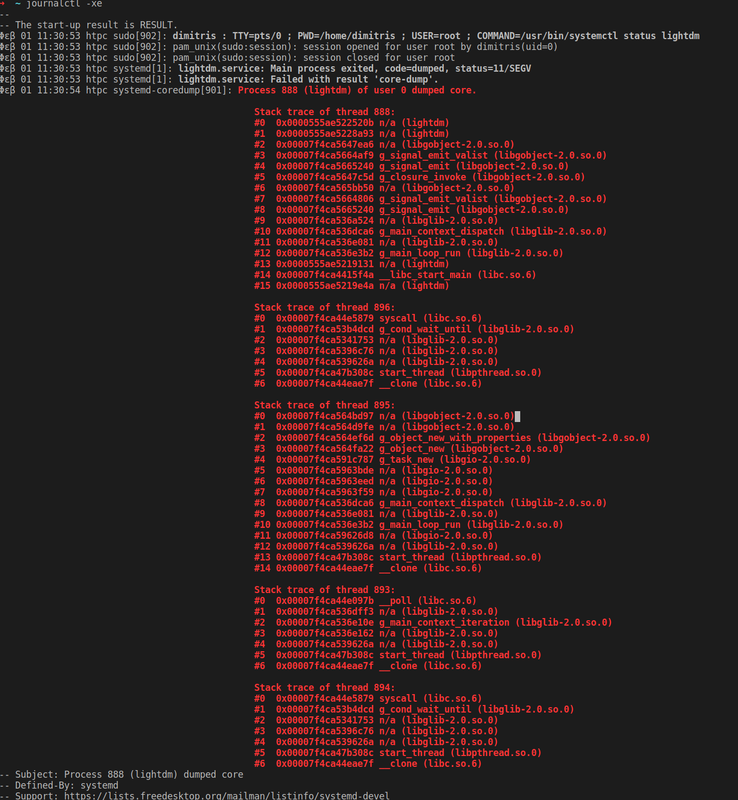 never have lightdm coredumping … may try to remove complete and reinstall to see if it is not caused by filecorruption. @joekamprad I tried. I got gdm and lxdm to see if I can replace it, but both are not working. In the process I updated the nvidia drivers, and now I’m kind of stuck because I cannot get them to work. It’s probably cause the gpu card is old ( Geforce 7600GS , it needs 304 nvidia drivers ). I ordered a new GPU to see if getting latest nvidia drivers will fix it. In any case, what’s the process to completely remove lightdm and. either replace it with something else or re-install it? but it looks like they are not aviable anymore, so you will be forced to use open source nouveau driver to get system bootup again to X!!! @joekamprad I’ve already orderer a 1050. Thanks though. Regarding lightdm, how can you replace it with something else? I’ve tried gdm and lxdm and failed both times. replace gdm with the one you installed. but with your current graphic card you need to go back to nouveau first! X and any DM will not start with properitary Nvidia driver installed! @joekamprad I thought to get nvidia you do pacman -S nvidia nvidia-utils and then sudo nvidia-xconfig. What else does nvidia-installer do? I got the new card, installed the nvidia drivers ( nvidia-smi reports the card just fine ) for again I cannot launch a graphic environment. lightdm fails like before, and gdm flashes the screen for a few times and then gets stuck. I can see this in the logs GdmLocalDisplayFactory: maximum number of X display failures which I guess means that it tries to find a screen? I ran nvidia-xconfig so set a new xorg.conf, but again the same. I cannot understand what’s the problem. is creating a useless xorg.conf… nvidia-installer is checking packages and removing nouveau and also do the config files for nvidia. so you will be able to run commands. I did all that, removed the xorg.conf and ran nvidia-installer -f again to write a new one. Φεβ 03 15:42:10 htpc gdm: Child process -948 was already dead. Φεβ 03 15:42:10 htpc gdm: Child process 937 was already dead. Φεβ 03 15:42:11 htpc gdm: Child process -978 was already dead. Φεβ 03 15:42:11 htpc gdm: Child process 967 was already dead. Φεβ 03 15:42:12 htpc gdm: Child process -1008 was already dead.